Originally published in the WHO Goodwill Ambassador’s Newsletter for the Elimination of Leprosy, Issue No. 9 (August 2004). The information was correct and current at the time of publication. had the right attitude to coping with the disease, as Izzet describes. 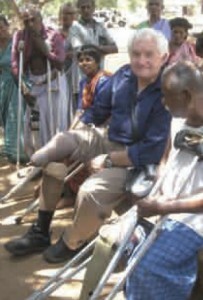 Dan Izzett pictured at a Government Rehabilitation Home near Chengalpattu, Tamil Nadu, on a visit to India in September 2003 to participate in an IDEA workshop. I grew up with my mother and brother in Harare, my father having died when I was eight. When I was at boarding school in 1962, I kept burning and banging my hands without feeling anything, but thought this was a phase all 14-year-olds went through! In August 1970, I married Babs and the following November I broke out in a rash. I went to see a dermatologist who diagnosed me as having an STD (Sexually-Transmitted Disease)! I told him that that was impossible but he accused me of lying. Bewildered, I ended up taking three courses of treatment, none of which had any effect. By this stage my feet and legs had also lost all sensation. Eventually, the dermatologist referred me to another doctor who, after many other tests, took a biopsy and sent it off to the government medical officer in charge of leprosy work. It was only in July 1977 that I was finally diagnosed as having leprosy — a shock, but also a relief after my previous misdiagnosis. During all this time, Babs, our families and close friends stuck by me. I was aware of the stigma surrounding leprosy and I didn’t want to tell anyone except my family. At work I only told my boss. My mother and I tried to work out how I had caught the disease as a child but we couldn’t come up with any answers. There was no point wallowing in misery, I just had to take hold of the situation. One morning in 1977, I soaked my feet in a basin while I was shaving. The water, which I’d thought was cool, was extremely hot. After scraping off the dead skin and rubbing in cream, I went to work. That evening when I took my shoes off, my feet were a mass of blisters. An infection started in the little toe of my right foot, which soon spread to the metatarsal bones. The next few years were incredibly difficult as I was in and out of the hospital as the infection worsened. Added to this, Babs, pregnant with our second son, developed patches on her skin. The dermatologist told her it was psychological — that she’d broken out in what she thought were insensitive patches in sympathy with me. Not convinced, she decided to have a check-up at the tropical disease unit. Yes, Babs had contracted leprosy as well. She was put on Dapsone, which killed the bacilli before any disabilities developed. However, over the next two years, she suffered severe pain as her body’s defenses reacted to the dead bacilli and caused inflammation of the nerves. We had some dreadful days when we were both confined to bed. On 23 August 1980, surgeons amputated my right leg below the knee as a last resort to stop the infection. There was no point wallowing in misery, I just had to take hold of the situation and plough on through. Well, I call her the “Iron Lady” for coming through her own illness, all the while supporting me and caring for the children. Although I’ve felt frustrated, I’ve never felt bitter about my illness. I’ve just kept going, knowing that tomorrow I must provide for my family, tomorrow I’ve got to get up and make the best of life. Chairperson of The Leprosy Mission Zimbabwe. Also a partner in the Leprosy Forum of Zimbabwe, which reaches out to those with the disease and trains people in early detection.